German pump manufacturer, KSB, has released a new app called the KSB FlowManager, which can be used for operating and configuring its PumpDrive 2 and PumpDrive 2 Eco variable speed systems. 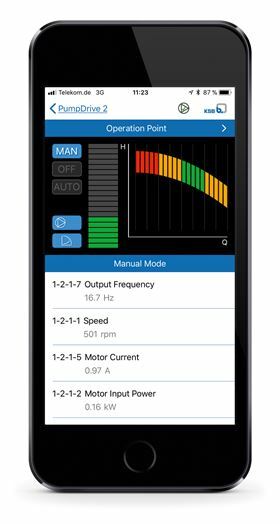 The new app can also be used to adjust the fixed speed of MyFlow Drive to the optimum operating point and features all the functions of previous versions of the MyPump Drive app and supports both IOS and Android devices. The KSB FlowManager shows the current operating point and provides access to all key parameters, alerts, warnings and records of trends. It also has a commissioning wizard for open-loop control, discharge pressure control and differential pressure control. The app also features the external Bluetooth gateway, which allows wireless communication via smartphone, tablet or notebook. The gateway does not have to be built into the devices but can be attached externally to the service interface of the devices. The KSB FlowManager app is available for download from the iTunes Store and Google Play Store free of charge.